In 1920, Grace Pattison and her youngest daughter Lois moved west to California to help relieve Lois’ symptoms of rheumatoid arthritis. Before leaving Superior, Pattison made one final gift to the people of the city by donating Fairlawn, the family’s beloved grand Victorian home her late husband had built along Superior Bay, to the Superior Children’s Home and Refuge Association. Pattison was a founding member of the SCHRA, formed in 1904 with a mission to assist in caring for children and young women of need in the community. The SCHRA had been housed in numerous facilities over the years, outgrowing each of them in succession. Grace Pattison remedied the Association’s dilemma with her astonishingly generous gift; however, it was not without certain stipulations. Fairlawn was to be used only as a home for the care of Protestant children and women, and in the event that the SCHRA were ever to sell the property, all of its buildings must be torn down. 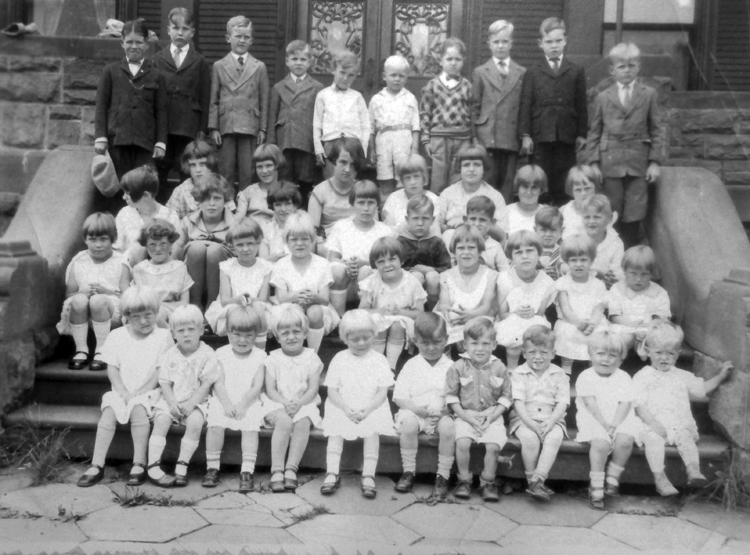 Today people often misrepresent Fairlawn’s SCHRA years by calling the house an orphanage, but many of its young tenants had at least one parent. “When Fairlawn was a Children’s Home,” a document prepared by the Douglas County Historical Society, explains that, “[t]he boys and girls who lived at Fairlawn when it was a children’s home came from many diverse and tragic circumstances. Some came from large families too poor to survive, some had only one parent, some had problems at home with alcohol or abuse.” And some were indeed orphans. Residents of SCHRA also included unwed mothers who assisted with daily chores and the care of younger children until they gave birth. Their children were then placed with adoptive parents, and the young women left Fairlawn. Throughout the next 42 years, more than 2,000 children and young women called Fairlawn home for some period of their life. The home could accommodate up to 40 or 50 children at one time. The SCHRA financed the operation largely through donations from local individuals and organizations, as well as the proceeds from a grand charity ball held each year. Local businesses routinely donated food, clothing, coal, and other necessities. There have been several reunions of the Children’s Home residents held at Fairlawn, hosted by the Douglas County Historical Society and Superior Public Museums. Much of what is known about life at the Children’s Home has been shared by past residents either attending the reunions or just coming back to take a tour and see the mansion they once called home. Many of their stories have been collected and archived at Fairlawn Museum. Their stories tell a tale of both sorrow and joy, of feeling scared or safe, of resenting their circumstance or just feeling grateful for warm shelter and food to eat. Residents of the Children’s Home were given the basics—a roof overhead, a clean bed and clothes, three meals a day, haircuts, medical and dental care, and discipline. The staff consisted of a head matron and between five to eight assistants. The girls and unwed mothers were housed on the second floor, which also held a nursery for the infants or “crib babies.” Like the expectant mothers, the older girls often helped care for the little ones. The third floor held the boys’ rooms. The children were not allowed on the first floor except in the dining room for meals and the former sitting room when family came to visit. They were also restricted from going into the basement and attic. The children each had their own bed and a small locker for their clothing. In the early years, personal belongings such as toys were not allowed—all playthings were provided by the Children’s Home and shared equally. This helped avoid potential squabbles. In later years, some rules, including this one, were relaxed. Days at the children’s home were fairly institutionalized and routine. The children dressed and came down for breakfast, after which they went to school. When school was out for the summer, they attended to chores and, unless one were sick or the weather inclement, were expected to play outside throughout the day. They came in for lunch and again for dinner; later they cleaned up before bedtime and lights out. Sunday was visiting day; some children received visitors while others were allowed to go to family or relatives’ homes for the day. Holidays and special occasions offered a break in the routine. Residents recall decorating a tree and each child receiving a gift to unwrap, sometimes a toy or doll they had hoped for, provided by donations from local businesses. The children often conducted a pageant for SCHRA board members and community business leaders, after which the children would open their gifts. For Halloween the Shriners would come and bring a small sack of candy for the kids, and then there would be music playing. I used to hurry after they would come, and I’d get my candy, and I’d sit on the window ledge in the back so I could see all the kids out on the street going from house to house with their costumes, and I would pretend like Alice in Wonderland, what it would be like to be a normal kid, running the streets. Visiting celebrities made for exciting breaks in Fairlawn’s daily routine. Such visits were fashionable during the Children’s Home’s early years when there were few charities and causes for celebrities to endorse. SCHRA welcomed its share of famous Americans, including Bob Hope and Doris Day, Irene Ryan (most famous in her role as Granny on the Beverly Hillbillies), and Babe Ruth, who had been raised in an orphanage himself. One of the legacies of Fairlawn’s SCHRA years are the ghost stories, easily found on the internet. One such tale tells of the spirits of two young children who died by drowning in the mansion’s pool. While the pool can still be found in Fairlawn’s basement, it was drained long before any children lived at the estate and has not held a drop of water since. Throughout its years as a children’s home Fairlawn remained in fairly good condition, due in large part to the household’s strict routine and limited use of the main floor. The concerns of the children came first, and working with a limited budget, some cost-saving shortcuts compromised some of Fairlawn’s original craftsmanship. Inside, dropped ceilings were installed in some areas to help with heating costs. In others many of the beautiful, hand-painted ceiling murals were painted over, as was some of the woodwork on the upper floors. Thankfully, the ornate woodwork throughout the first floor was remarkably preserved—the children helped clean and polish the woodwork on a weekly basis, a chore many former residents recall when visiting Fairlawn. A sprinkler system was also installed as a safety measure. Changes to the exterior were much more dramatic. At some point the mansion’s exterior was covered in asbestos siding, and a fire escape was attached to the east façade. By the 1930s the conservatory had fallen into serious disrepair and was deemed hazardous and was demolished and removed from the site. During World War II the ornamental iron fence surrounding the estate was sold for scrap. The most dramatic loss to the estate was the carriage house, burned to its foundations in 1950. The cause of the fire remained unknown until 1995, when a contrite gentleman attending a reunion of SCHRA residents confessed that he and a few other boys had accidentally started the blaze while playing with matches. In the early 1950s Fairlawn’s iconic turret blew down in a severe windstorm. By then the building, still a prominent outline against Superior’s waterfront landscape, bore little resemblance to its former elegance. But the future had other things in store for Fairlawn, including a complete restoration. Story by Judith Liebaert. Originally published on Zenith City Online (2012–2017). Click here for more stories by Judith Liebaert.